The Crimson Armada: Where Does 2011 Alabama Stand? While calculating my mid-season SDPI ratings back in October, I got the notion that this year's Alabama team could be one of the best college football teams ever. Of course, almost immediately after that post, the Tide lost a tight home game to LSU and seemed doomed to be just another Sugar Bowl champion. After they were written off, all the other challengers faltered and the Tide ended the season ranked number two in the BCS. In the hyped rematch, the Tide dominated LSU and claimed their second BCS Championship in three years. Even with the loss, Alabama still enjoyed a dominant campaign. But how dominant? Where do the Tide rank in terms of recent national champion? To find out, I looked to see how Alabama compared to each national champion since 1993 in four different categories. Why 1993? Its completely arbitrary, but that is when I first began to follow college football. The first category of dominance I looked at is scoring margin. 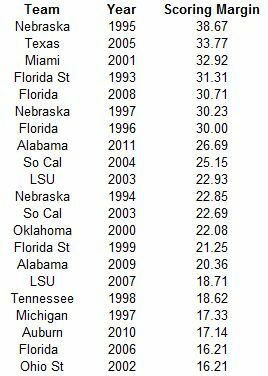 The following table lists how the past 21 national champions (1997 and 2003 featured two champions) have fared in terms of per game scoring margin. By this measure, Alabama ranked eighth among the 21 teams. 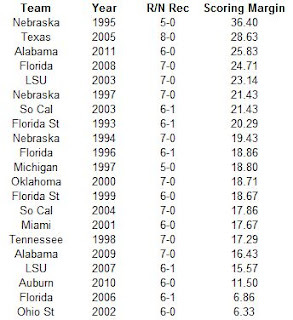 Their scoring margin was very good, but not quite ridiculous like that of 1995 Nebraska. 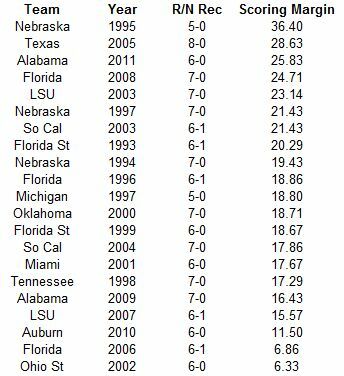 Notice that if we take the scoring margin of the two worst teams (2006 Florida and 2002 Ohio State), and add them together, it still does not equal the margin of that Nebraska team. A few other tidbits from the table: Four of the top-eight teams on the chart actually lost a game (1993 Florida State, both Florida teams, and this year's Alabama). I think its a little ironic that the bottom two teams are Ohio State and Florida. As you may recall, Florida beat a solidly favored Ohio State to win the title in 2006. The second category of dominance is scoring ratio. Scoring ratio is simply the number of points scored divided by the number of points allowed. A team with a ratio of 1 would have scored and allowed the same number of points. While scoring margin tends to favor teams with great offenses, teams with great defenses will fare well in scoring ratio. Here is how the past 21 champions have fared in scoring ratio. When you only allow a shade of eight points per game, your scoring ratio is bound to be pretty good. 2011 Alabama ranks second to the 2001 Miami Hurricanes in terms of scoring ratio and are one of just three teams to have scored more than four times as many points as their opponents. Once again, as in the previous table, a loss certainly does not preclude dominance. Four of the top-six teams (2011 Alabama, 1993 Florida State, 2008 Florida, and 2003 LSU) all lost a game. The third category of dominance is number of wins by twenty or more points. Alabama ranks very highly by this measure. Ten of their twelve wins came by 20 or more points. The only victims that were able to hold the margin under 20 points were Penn State (16 points) and perhaps surprisingly, Mississippi State (17 points). 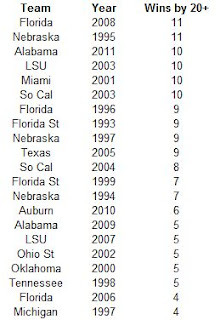 1995 Nebraska is tied with 2008 Florida atop the list. The Cornhuskers lone victory by fewer than 20 points in 1995 came against Washington State (14 points). The final category of dominance is performance away from home. The table below ranks the 21 teams by their road/neutral field scoring margin. Their road/neutral field record is also listed. Once again, the Crimson Tide do not disappoint. 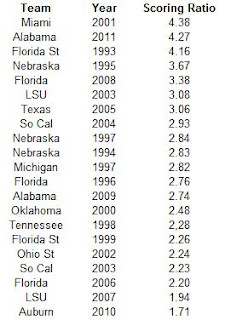 Only 1995 Nebraska (sensing a trend?) and 2005 Texas fared better on the road than Alabama. Once again five of the top-eight teams in road scoring margin lost a game (2011 Alabama, 2008 Florida, 2003 LSU, 2003 Southern Cal, and 1993 Florida State). Perhaps more interestingly, 2011 Alabama, 2008 Florida, and 2003 LSU all lost at home! The most surprising number on this chart belong to 2001 Miami. 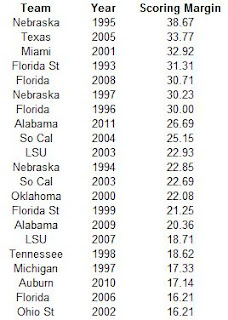 The Hurricanes are widely regarded as one of the best champions of the BCS-era, and they do rank third in scoring margin, first in scoring ratio, and tied for third in wins by 20 or more points. However, their road/neutral field performance ranks only 15th. The Hurricanes struggled mightily in a pair of road games against decent, but hardly dominant conference foes. They beat Boston College 18-7, in a game with a misleading final thanks to a steal of an interception and return by Ed Reed. See below. They also edged Virginia Tech 26-24. Both of those teams managed 8-4 marks, but neither was a great. So where does 2011 Alabama rank in terms of champions of the past two decades? 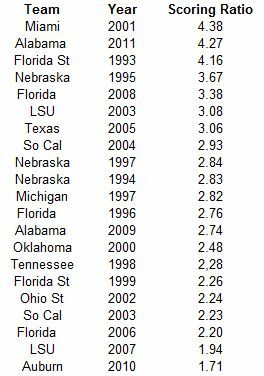 For my money, 1995 Nebraska is head and shoulders above everyone else. However, after the Cornhuskers, I think Alabama belongs in the conversation with 2008 Florida, 2005 Texas, 2001 Miami, and 1993 Florida State (a very underrated champion) as the second best champion. And who is the worst? No one team stands completely out, but two certainly do. Its a close race between either 2006 Florida or 2002 Ohio State. I'll say this for LSU, they have impeccable timing. They always seems to save their best teams when the national championship is in New Orleans. See 2003 and 2007. The difference this year though is that the Tigers actually avoided losing any games in the regular season. And what a regular season it was. The Tigers beat the Pac-12 champ (Oregon) at a neutral site, the Big East champ (West Virginia) on the road, and their opponents in this game (Alabama) on the road. Aside from the 9-6 win over Alabama, no opponent came closer than 13 points against the Tigers. Alabama had a similarly dominant season. While they lacked the non-conference scalps procured by LSU (Alabama's best win was at offensively inept Penn State), nine of their eleven wins came by at least 20 points, with the other two coming by 16 and 17 respectively. While it is likely we will see at least one touchdown in this game, it should be low-scoring like their initial encounter. Both these teams were uber-dominant on the defensive side of the ball in 2011. In their eleven games against BCS-conference teams, LSU allowed 12 offensive touchdowns. That's amazing! However, Alabama one-upped them, allowing just six offensive touchdowns in their nine games against BCS-conference teams. Both these teams are clearly the best the nation has to offer this year. LSU has the better scalps, but Alabama has the better statistical profile. Thus, the Tide are my final lock of the bowl season. Congratulations are in order for Virginia Tech. The Hokies stole earned the ACC’s first ever at-large BCS bid. Did they deserve it? Probably not. However, every game that is not the BCS National Championship Game, be it the Rose Bowl or the Famous Idaho Potato Bowl, is nothing more than a glorified exhibition. 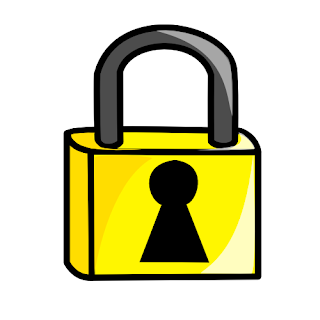 The powers that be choose who they want to play in those games, and we the public have just three options available to us. To watch, to not watch, or to sort of watch while playing Words With Friends. While the Hokies may not deserve this bowl game, it still presents an intriguing matchup. Virginia Tech suffered two losses all season. Unfortunately, both defeats came at the hands (or paws) of the Clemson Tigers, preventing the Hokies from winning their fifth ACC Championship since joining the conference in 2004. While the Hokies won eleven games, their non-conference schedule was especially soft (Appalachian State, East Carolina, Marshall, and Arkansas State), and their only wins of note in the conference were over Georgia Tech and Virginia. Still, the Hokies were plenty dominant against their soft schedule, finishing with the third-best defense in the ACC and the second-best offense. The Hokies will be taking on a Michigan team making its first BCS bowl appearance since the Rose Bowl following the 2006 season. Michigan lost that game in unflattering fashion, lost the 2007 season opener to Appalachian State, pushed Lloyd Carr out the door, hired Rich Rodriguez, fielded the worst three defenses ever at the school under his watch, and culminated his tenure with a thrashing at the hands of an SEC also-ran. But now the Wolverines appear to be back on the right track under his successor Brady Hoke. The Wolverines maintained the offensive efficiency they developed under Rodriguez (finishing third in the twelve-team Big 10), and also improved their defense (finishing third after ranking last in 2010). The Wolverines also defeated Ohio State for the first time since 2003, though it should be noted the Buckeyes managed just a 6-6 record, so there was no parade. Michigan is probably the better team, but the Wolverines lack of a smooth passing attack has caused them to bog down (see games against Michigan State and Iowa) when facing a strong defense. For that reason, a play on the Hokies to win outright may not be a bad idea. Win or lose, Kansas State will remain one of the most surprising teams of 2011. After failing to win more than seven games in any season since 2003, the Wildcats already have ten wins and will be clawing for their eleventh against Arkansas. The Wildcats won ten games despite ranking just ninth in the ten-team Big 12 on offense and fifth on defense. Their statistical profile befits a team that went 6-6 or 7-5, not 10-2. How did they do it? For starters, their turnover margin of +13 ranks sixth in the nation. They also added five non-offensive touchdowns and went an amazing 8-1 in one-possession games. That's not to say the Wildcats don't have players. Quarterback Calvin, err Collin Kelin ran for an amazing 26 touchdowns! Klein is somewhat limited as a passer, but the Wildcat offense is built around the running game. Arkansas on the other hand, is built around the passing game. Quarterback Tyler Wilson helped lead the third-best offense in the SEC (behind Alabama and Georgia). Wilson tossed 22 touchdowns and just six interceptions on the year. On paper, this seems like a walk in the park for Arkansas. However, Hogs were below average on defense, finishing ninth in the SEC. Plus, outside of South Carolina, the Hogs don't really have any great wins. Sure they beat bowl teams (Texas A&M, Auburn, Vanderbilt, and Mississippi State), but none of those teams were especially strong. Look for Kansas State to keep this one close, but I don't think they have the firepower to win outright. SMU and Pittsburgh have quite a bit in common. At least more than you probably think. Both were college football powers in the late 1970's and early 1980's, with Pitt winning a national title in 1976 and SMU finishing in the top-10 in 1981, 1982, and 1984. Both went through serious dips in the 1990’s with Pitt suffering five straight losing seasons from 1992 through 1996. SMU was given the Death Penalty thanks to their cavalier attitudes toward boosters during their run in the early 80’s. They were forced to shutter the program for the 1987 and 1988 seasons. When they returned to playing football in 1989, they endured eight straight losing seasons and did not play in a bowl game until 2009. Both also had ties to the most recent Arizona State coaching search. SMU coach June Jones initially interviewed for the job, and was apparently ready to accept the position until the Sun Devils went in another direction. That direction was due northeast. Pitt coach Todd Graham accepted overtures from the Sun Devils to become their coach and left Pitt after just one season guiding the Panthers. Thus there is quite a bit of drama for a bowl game featuring teams that enter with a combined 13-11 record. Despite their 6-6 mark, Pitt actually performed quite well in Graham’s first and only season at the helm. The Panthers boasted the third ranked offense and second ranked defense in the Big East, but were undone by a poor record in close games (2-4). The Mustangs from SMU seemed poised for a breakthrough season when they upset TCU and beat defending Conference USA champ UCF on consecutive weekends to stand 5-1 in early October. They proceeded to win just two of their final six games, losing in non-competitive fashion to Houston, Tulsa, and Southern Miss (lost by 85 combined points in those games). Surprisingly, SMU has yet to feature the dynamic offense that Jones was known for at Hawaii. The Mustangs ranked just eighth in Conference USA on offense and have yet to finish higher than fourth in any of Jones’ four seasons (cue Frankie Valli) at the helm. Pitt is the better team and should win, but with the turmoil (on both sides) and the motivation factor (SMU would love to knock off a team from a BCS conference) I wouldn’t feel confident taking them to cover here. Very quietly, Arkansas State has positioned themselves to be a Sun Belt power for at least the next season or two. It started when they hired Hugh Freeze to direct the offense after a disappointing 2009 campaign. The 2009 team finished with the worst offense in the Sun Belt, and hired Freeze to heat things up. The Red Wolves responded by posting the third best offense in the Sun Belt in 2010. However, the team posted a poor record in close games (1-5) en route to a 4-8 finish and head coach Steve Roberts was canned. Freeze was promoted to the top job and the offense continued clicking, this time ranking first in the conference. The defense also improved (ranking first in the conference as well) and the team blitzed through Sun Belt play unbeaten. The Red Wolves became the first Sun Belt team to win ten games in the regular season (joining the 2009 Middle Tennessee State team as the only other Sun Belt team to win ten period). They are also ranked 28th in the latest AP Poll, so with a win here, they could conceivably become the first Sun Belt team to ever be ranked in the top-25 as a Sun Belt member (North Texas was ranked once back in the day). Of course, as is often the case at schools like Arkansas State, success usually means your coach is leaving. Sure enough, Ole Miss tabbed Freeze to become their next coach. Not to worry though, the Red Wolves pulled off one of the biggest coups in finding their next coach when Gus Malzahn agreed to lead the team. Malzahn is an offensive innovator, and while his offense at Auburn struggled in the SEC without Cam Newton, Malzahn’s previous track record at Arkansas and Tulsa indicates the offense should remain in good hands. Arkansas State will be battling a fellow mid-major conference champion in the Northern Illinois Huskies. The Huskies won the MAC for the first time since 1983 in Dave Doeren's first season as coach. The Huskies were especially good on offense, where they ranked second in the MAC, but much less so on defense, where they ranked just seventh. This is one of the better, more under-appreciated bowl matchups of 2011. It’s a little off the beaten path, but tune in to see a pair of established signal callers, Ryan Aplin of Arkansas State (can we call them the Aplin Dumpling Gang?) and Chandler Harnish of Northern Illinois (a poor man’s Dan LeFevour who was a poor man’s Tim Tebow), running a pair of entertaining offenses. If you feel like making a play, take the Red Wolves in this one.